Brand new: Office supports transformation of MJ Insurance The insurance industry has a long history, yet changes in technology have resulted in a massive transformation in a short period of time. Since its beginnings more than 50 years ago, MJ Insurance has evolved, too. 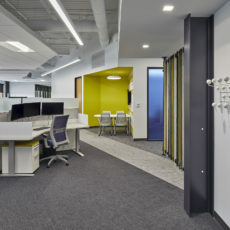 By making a strategic decision to move to a new office, MJ created an environment consistent with their updated value proposition and refreshed brand. MJ Insurance’s office relocation addressed multiple goals. MJ engaged DORIS Research to gain clarity around how they wanted to work and involved OfficeWorks early on in the design process. Based on MJ’s goals, OfficeWorks provided them with customizable options—an approach that, according to Jon Loftin, president and chief operating officer, made the process much easier. “With our budget restraints, OfficeWorks did a fantastic job giving us options that allowed us to come in just under budget,” Brian added. OfficeWorks’ process also providing mock-ups of the workstations, so team members could see and try out the furniture ahead of time. 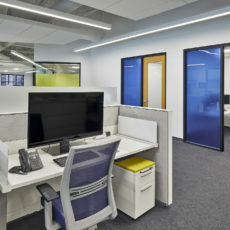 The resulting space creates a new image for MJ and an improved environment for its team members. Tricia Everhart, director of support services and facilities, MJ Insurance, said that on the Monday after moving weekend, everyone was ready to go with their technology and workstations. “It can be hard to look at an image and get an idea of what it looks like but now that we’re living in it, it’s exactly what OfficeWorks said it was going to be,” Tricia said. “From day one, they were embracing all the new spaces and using them as intended,” she said.